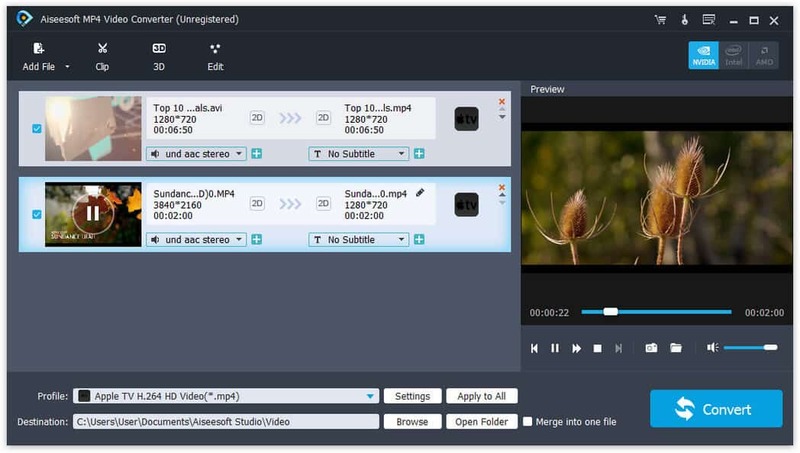 Aiseesoft MP4 Video Converter is the professional MP4 Video Converter to convert all popular video files to MP4 video and any other video/audio formats, including 3GP, 3G2, AVI, DivX, FLV, H.264, H.264 AVI, WMV, MPEG-1, MPEG-2, MPEG-4, H.264/MPEG-4 AVC, M4V, MOV, XviD, HD video and AAC, AC3, AIFF, AMR, FLAC, AU, M4A, MKA, MP2, MP3, OGG, WAV, WMA audio. It also allows you to convert among any audio. Moreover, it will bring you much faster converting speed with AMD APP and NVIDIA CUDA technology, and it has been added iPhone 6s/6s Plus, iPad mini 3, iPad Air 2 profile, and it support iPod Touch 5 and iPod Nano7 now. The converted video/audio files are highly compatible with iPhone 6s/6s Plus, iPhone 5s/5c, iPad mini 3/2, iPad Air 2, iPad Air, iPad Pro, iPod touch 5, iPod nano 7, Samsung Galaxy Note 3 and HTC One X, etc. This MP4 converter enables you to adjust video brightness, saturation and contrast. Also the &quot;Deinterlacing&quot; feature can help you convert the interlaced video to a progressive one.